This is a short clip from Modulator ESP's radio concert. Modulator ESP previously played on Galactic Travels once before. 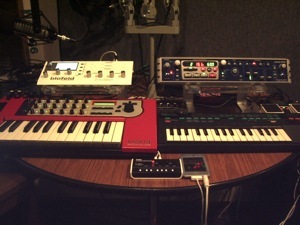 For show #701 on September 9, 2010, Modulator ESP played a live radio concert. 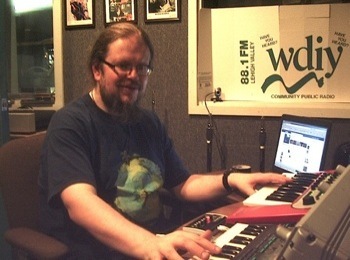 In 2011, after playing at the Soundscapes Concert Series, Modulator ESP played at Grim Planetarium at Kutztown University and he returned to Galactic Travels on show #753, airing on September 8, 2011. A short clip from this concert is in the player above. He then went on to play at the electro-music 2011 Festival and Conference. MODULATOR ESP: Modulator Experimental Synthesis Project, a.k.a. Modulator ESP, performs improvised music that explores the boundaries of dark ambient, drone, Berlin School sequencing, and noise using modular synthesis, real-time sampling, sound manipulation, and live looping. Modulator ESP has been described variously as "vintage synth overload to propel you into the outer reaches of the cosmos" and "one man will descend to (this) earth in a hail of analogue synth tones; called upon from the singular consciousness of John Carpenter and Vangelis - like a 2046 dystopian dream with the optimism of Jean Michael Jarre, and his penguins." When Modulator ESP discovered that there was more to EM than TD, Jarre, Pickford and Shreeve by finding bands like Arc, RMI, Redshift, Airsculpture, and Arcane, bands that were doing a more retro-styled improvisational take on EM, it came as a revelation to him. One of the reasons he'd left the band he was in was because he wanted to do something a bit more freeform. He knew he still wanted to play live but without playing along to pre-programmed, structured backing tracks. Things started to snowball when he discovered certain synthesizers, both hardware and software, step sequencing, and delay processors. Modulator ESP loves playing synths because he loves the electronic, synthetic, other worldly nature of the sounds. This makes Ambient, Berlin School EM the best style for his interests. He plans to stretch the boundaries by incorporating some of his progressive influences.